"A very pleasing alcoholic punch to start a party going. It is colorful and tastes delicious." Place the orange juice, ginger ale, and champagne in the refrigerator to get them well chilled. 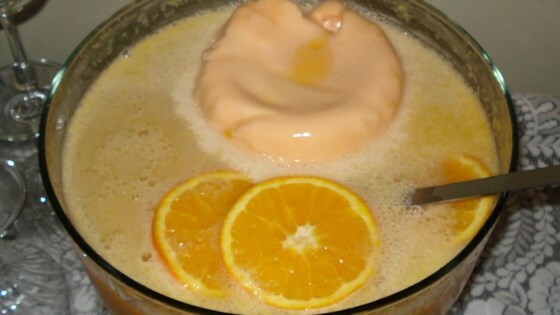 In a large punch bowl, place the block of sherbet in the center and pour the orange juice over the top. Next, pour the ginger ale over the sherbet. Finally, pour both bottles of champagne over the sherbet. Stir gently to mix the liquids, resulting in a foamy top. Serve immediately. Excellent punch! I added a package of frozen strawberries to keep it chilled and it was also good. Will definitely make it for this New Year's again! Served this at a bridal shower, and it was a big hit. Received several requests for the recipe. MY MOM MADE THIS FOR CHRISTMAS EVERY YEAR WHEN I WAS SMALL . I HAVE BEEN LOOKING FOR THIS RECIPE FOR YEARS! IT IS WONDERFUL! This is always a hit for every occasion I serve it. Everyone keeps filling their cup and asks for the recipe. How simple and satisfying! !